When you live in a tiny home, outdoor living space can be a real blessing. 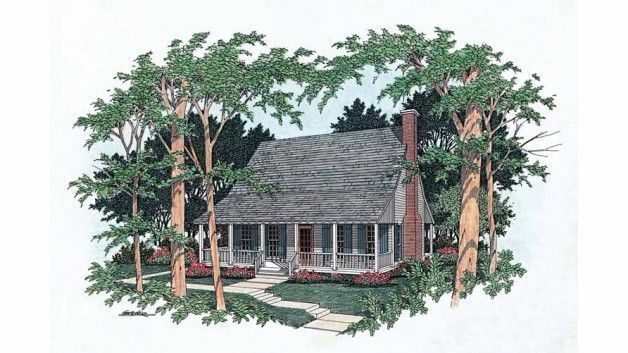 However, the question remains: would you prefer to have a private back porch or a more social front porch? Luckily, you don't have to choose! 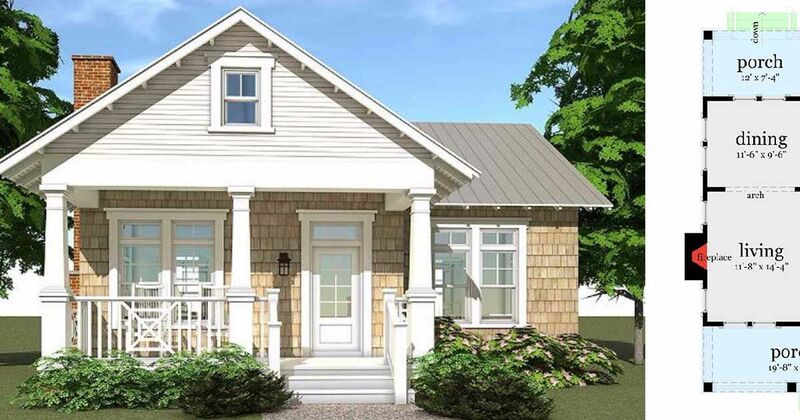 The following floor plans give you the best of both worlds: A front porch for when you want to sit and watch life go by and a back porch for when you want to hide away from the busy world and soak up some peace and quiet! 1. 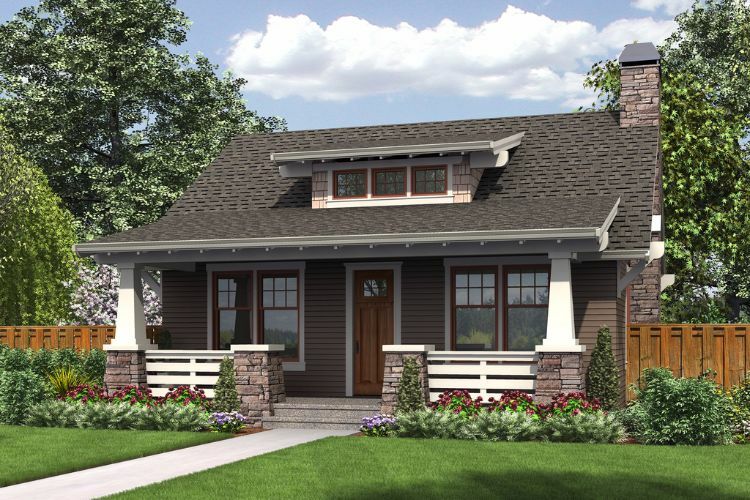 Craftsman bungalow from Houseplans. 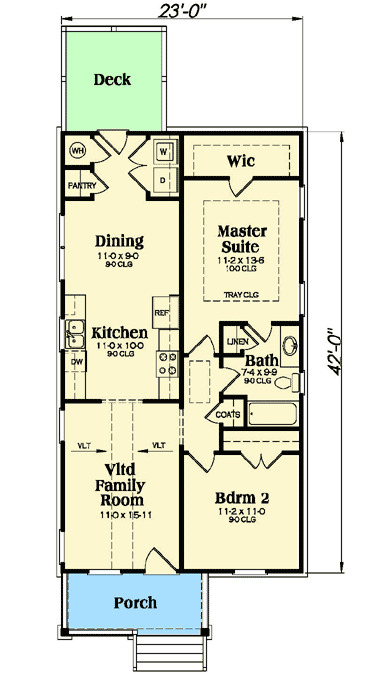 Measuring 960 square feet (89 square meters), this Craftsman design from Houseplans has plenty of convenient built-ins. A coat closet can be found right inside the front door, and continuing straight ahead will bring you to the great room. The front right corner of this room is occupied by a small guest room with a built-in bed and shelves. The kitchen is in the back left corner of the home, and double doors here lead out to the back porch. 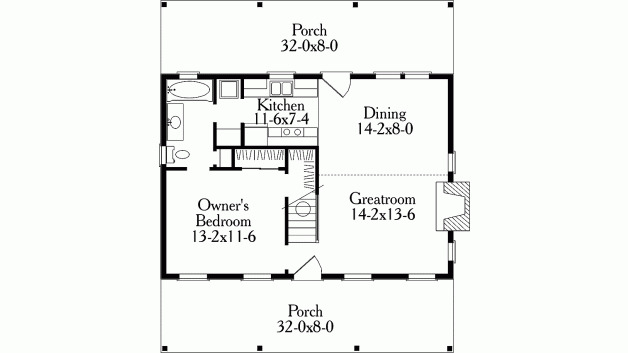 The bedroom, bathroom, and linen closet in the front left side complete the floor plan. 2. Simple cabin with sleeping loft from Family Home Plans. This simple but charming cabin from Family Home Plans comes in at 860 square feet (80 square meters), and the loft space upstairs means it would be great for either a couple or a small family. 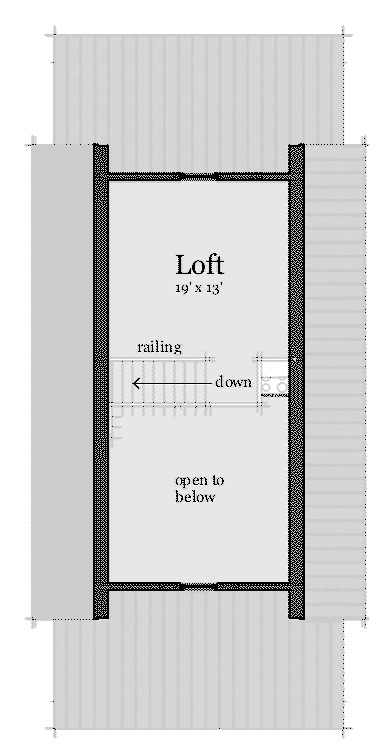 The front section of the first floor is taken up by an open concept living and dining room; an L-shaped kitchen is situated in the back right. A small storage space can be found right behind the kitchen, and the bathroom is directly behind that. A bedroom in the back left corner rounds out the design. 3. 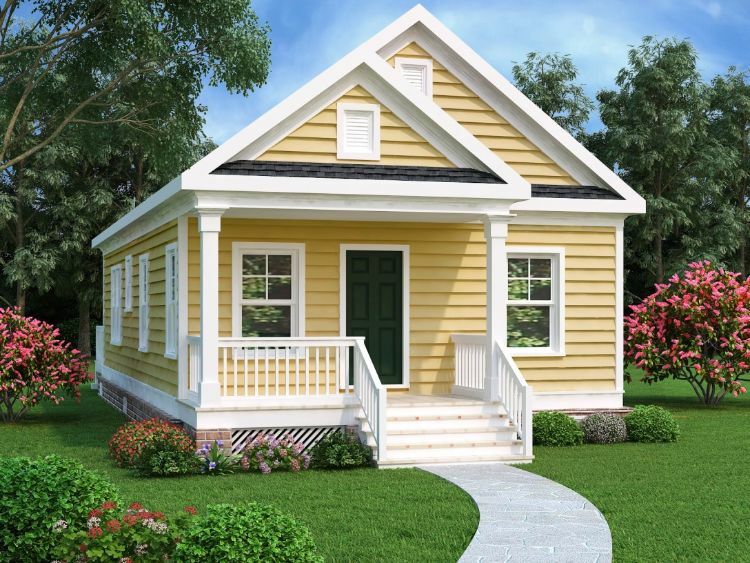 Narrow two bedroom bungalow from Architectural Designs. Coming in at 966 square feet (90 square meters), this narrow home from Architectural Designs has plenty of curb appeal. The front door leads into the family room, which boasts vaulted ceilings and leads into the kitchen. A dining room, laundry closet, and pantry can all be found behind the kitchen. A small hallway on the right leads to a coat closet, a bathroom, and two bedrooms, one of which has a tray ceiling and a walk-in closet. 4. 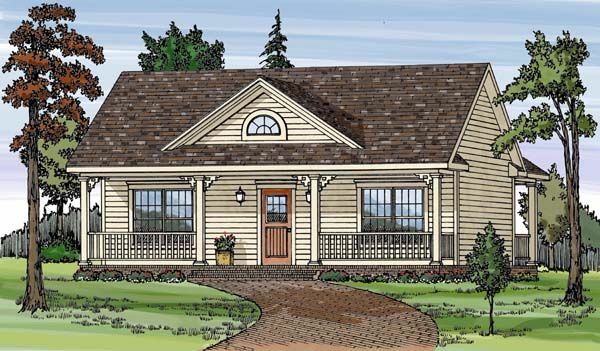 Cozy country home from Floorplans. 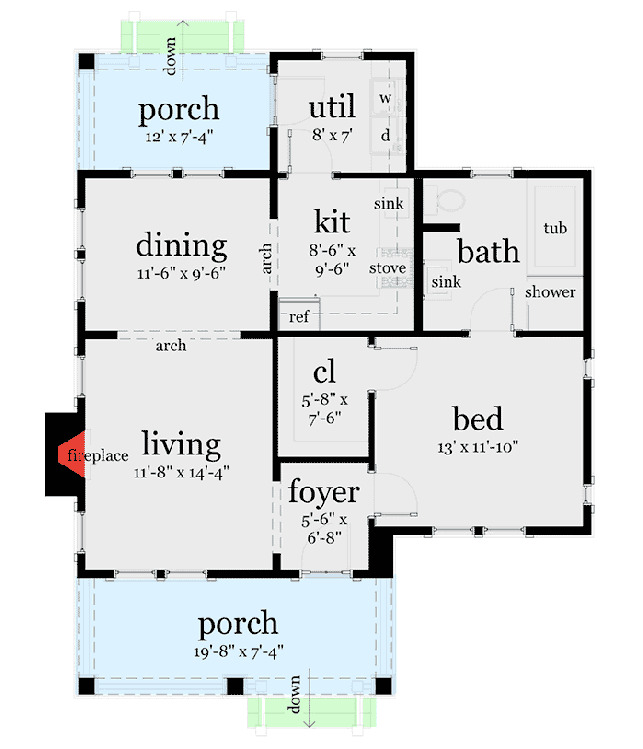 This lovely little home from Floorplans measures 923 square feet (86 square meters). Once inside the front door, a great room with a fireplace is off to the left, and the dining room is behind it. The back porch can be accessed from here, and the kitchen is on the left. 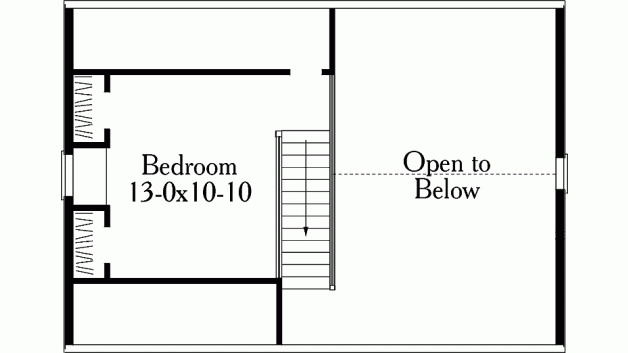 Pass through the kitchen to reach a bathroom with a tub, which in turn provides access to the home's main bedroom. The bedroom can also be entered through a door right next to the front door, making it possible to walk around the entire first floor in a circle. A second bedroom is located upstairs. 5. 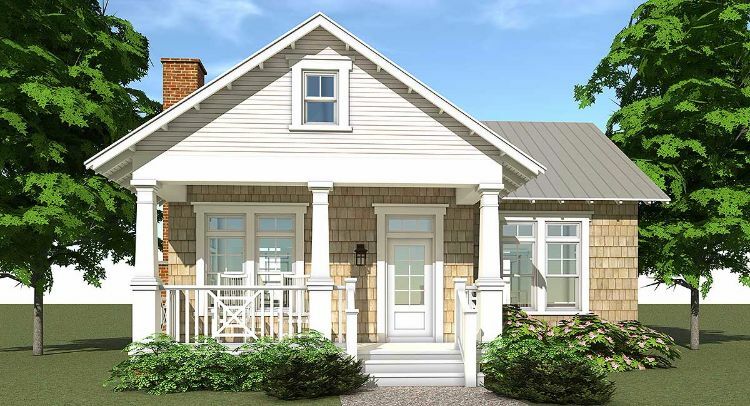 Charming one bedroom cottage from Architectural Designs. At 841 square feet (78 square meters), this one bedroom cottage from Architectural Designs has plenty of curb appeal. Step up onto the front porch and through the front door; you will find yourself in a foyer that provides access to the bedroom on the right and the living room on the left. The bedroom boasts a walk-in closet as well as an ensuite bathroom with both a tub and a shower. On the left side of the home, the dining room is right behind the living room. Sliding glass doors lead out to the back porch, and the kitchen on the right can be reached by stepping through an archway. A utility room behind the kitchen rounds out the design. 6. 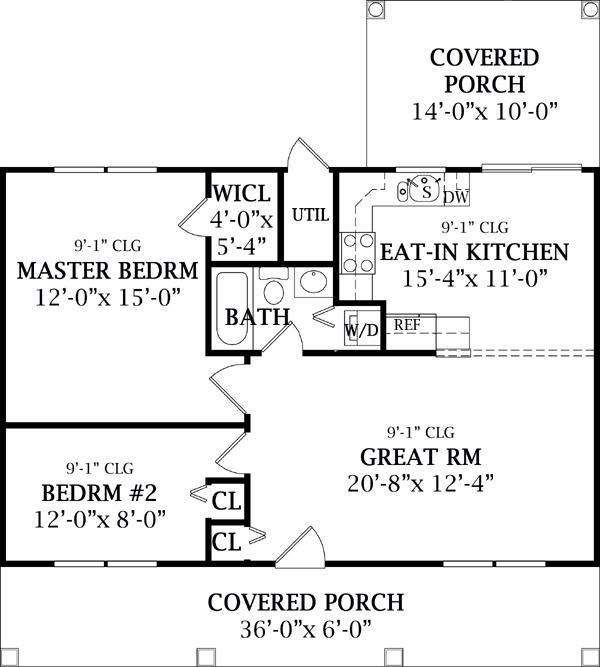 Two bedroom country design from Family Home Plans. 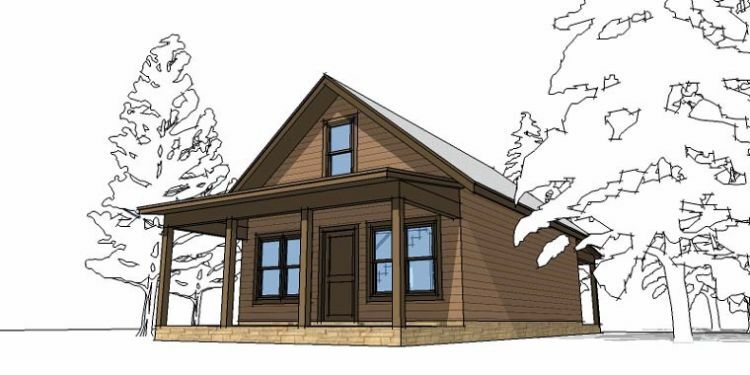 This tiny country home from Family Home Plans comes in at 864 square feet (80 square meters), and in true country home style, it has a large covered porch at the front. There is a coat closet conveniently located right inside the front door, and the great room is right here as well. A U-shaped eat-in kitchen is located right behind the great room, and it provides access to the back deck. Off to the left is a small storage space that can only be accessed from outside. 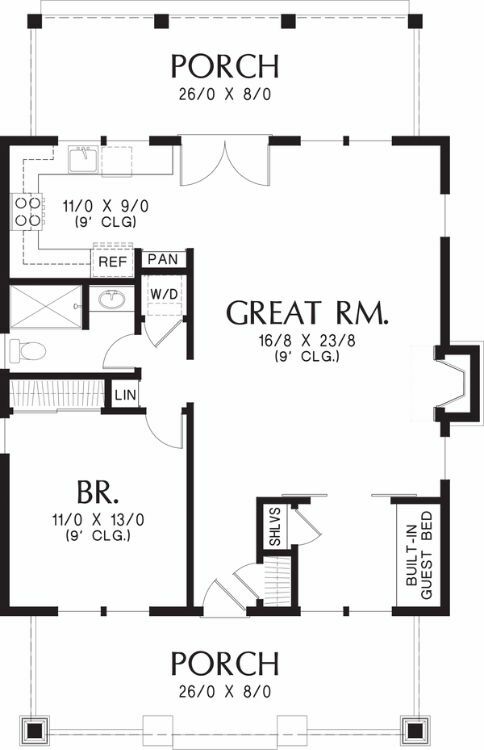 Two bedrooms and a bathroom are on the left; the master bedroom includes a walk-in closet.